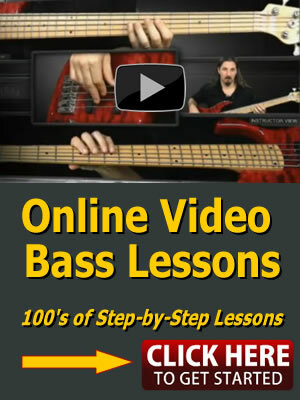 This video bass lesson is all about building bass lines that use the interval of a 9th. These bass line shapes involve the interval of a 9th above the root of the chord. Let’s take a look at a little bit of music theory in order to help you understand these bass lines a little better. A C major scale is just the natural notes from C to C. Under the note names in the scale I have assigned a number to each degree. There are only 7 different notes in a major scale before it starts over again with the same note name an octave higher. Oct is Greek for 8. When I reach that C again in a C major scale I number it as 1, but I could also number it as 8 for the octave. If I was to number that 2nd C as an 8, and then continue up one more note to D, I could number that as 9. 9 is the same note as 2, just an octave higher. Here is the first shape that we are going to look at on the neck of the bass that involves the 9th interval. I am going to play the root (C), the 5th (G) the octave (C), then the 9th (D). You can use this shape over all kinds of different chords, including but not limited to Major, Minor, sus2, Dominant 7th, Major 7th, and Minor 7th. Now let’s play a little groove going between a Cm and a Bb chord. You are just going to play the exact same shape for both chords. For the Cm start at the 8th fret of the 4th string (C), and for the Bb start at the 6th fret on the 4th string (Bb). At the end of the lesson you will find a jam track without me playing the bass line that you can practice with. Here is a variation on the last shape, only this time I am going to skip the octave and just play the root (C), the 5th (G) and the 9th (D). You can either shift your hand position to get up to the 9th, or do some stretching by playing the root with your 1st finger, the 5th with your 2nd finger, and 9th with your 4th finger. Now let’s play our same groove of Cm to Bb with this shape. The previous 2 bass line patterns were neither major nor minor, and could have been used over either chord. Major chords are made up of the 1st 3rd, and 5th notes of a major scale. So a C major chord is the notes C E and G. A Cm chord is the 1st, 3rd note lowered by 1 fret, and 5th note of a C major scale. Sometimes referred to as 1, b3 and 5. The b3 indicating that it is the 3rd note of a major scale lowered by a ½ step (1 fret). So now we are going to add in a 3 to give our shape a major flavor. The E note (3) is up a whole step (2 frets) above the D note (9). So after we play the root, 5th, and 9th, I am going to go up to 2 frets to E, and then come down to the octave above the root. So 1 5 9 3 8. Let’s try the same bass line pattern, only for a minor chord. The b3 is up a half step from the 9. So this time we are going to play the root, 5th, 9th, b3, and then the 8. So there is only a one note difference from the major pattern. So 1 5 9 b3 8. Now it’s groove time with our new major and minor bass line patterns. We are going to use the same Cm to Bb chord progression we have been using, but this time the shape for the minor chord is going to be different than the major chord. All of these patterns could also be played starting on the 3rd string as well, or even starting on the 5th string if you have one. Now it’s time to put what you have learned to work. First practice each individual bass line pattern separately with the jam track, then try mixing them up. You should also experiment with playing all of the notes in these patterns in different orders and with different rhythms.